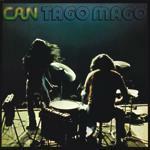 Mute have announced full details of the special edition release to commemorate the 40th anniversary of Can's Tago Mago. The new version of the album will be released on November 14th, and features the original artwork plus a bonus CD of live recordings from 1972. 2 December 2013 will see the long-awaited release of the Can back catalogue, remastered on vinyl for the very first time. All 14 albums, including Out Of Reach and an exclusive live bonus album, will be released on 180g vinyl in a box set alongside original posters and artwork.